Source: Greenwich News and Graphic. Friday, October 18, 1929. 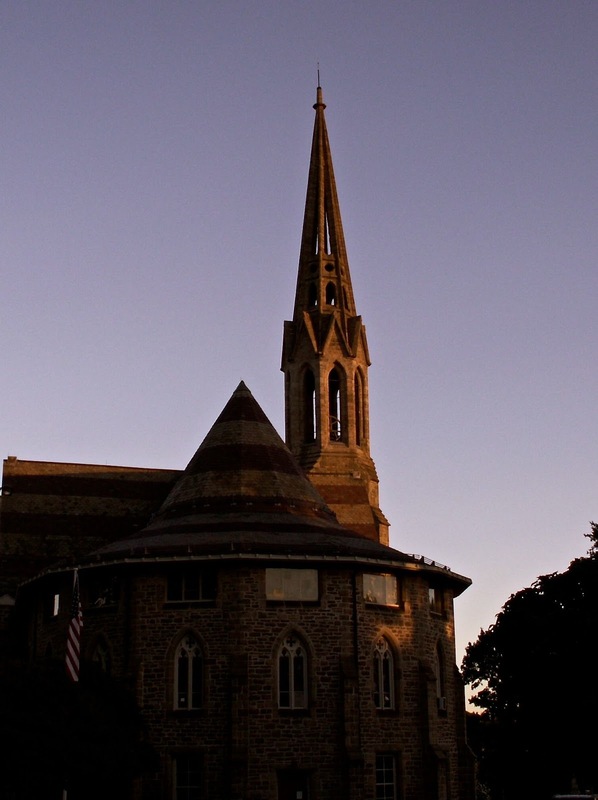 Wednesday, October 16, will always stand out as a red letter day in the records of the Second Congregational Church, the celebration in observation of the one hundredth anniversary of the Stillson Society being unprecedented in the history of the church. The ladies had worked indefatigably to make it a success, and the results exceeded their greets expectations. According to the treasurer, Mrs. Amos Mead, the proceeds of the affair amounted to $1,501.85. Mead Parish House (Former Solomon Mead House), Second Congregational Church, Greenwich. A delicious luncheon was served in the dinning room by the Guild, and in the parish house attractive booths of fancy and otherwise useful articles tempted the purse. On the upper floor a display of arts of crafts called forth continued expressions of wonder at the exquisite workmanship of the days of long ago. There were toys, unlike those of today; books, jewelry, including some made of hair; photographs as distinct as if of present-day finish, daguerreotypes, the real marvel of photography, and certificates of like membership in the missionary society upon payment of $30. Dresses for babies, children and grown-ups were greatly admired, as were the various samplers. But the display that attracted the greatest attention was the exhibit of old-time bedquilts, where novelty of design and intricacy of work showed the marvel of stitchery, all wrought by hand. 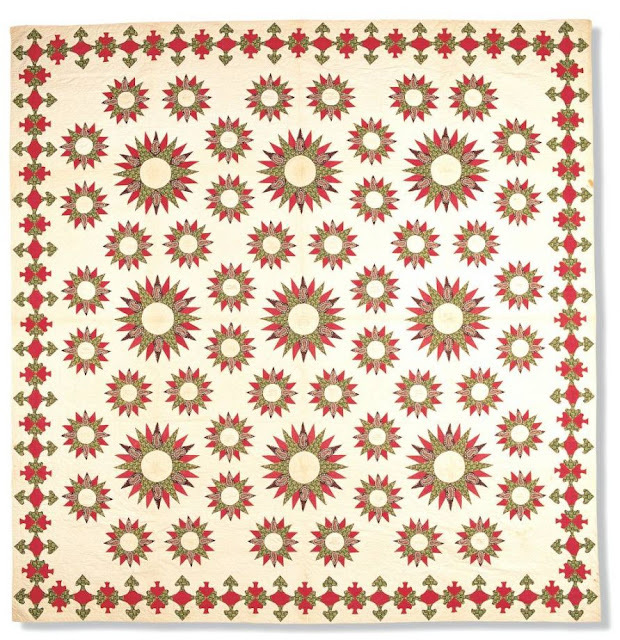 There were stars, sunbursts, feathers, wreaths, with many flowers being cut from printed muslin or cambric and appliquéd so deftly it as impossible to detect a stitch, while the quilting was tiny and exact as machine work. A counterpane made by Abigail Jane Reynolds (Mrs. William Mead) first secretary of the Stillson Society, and her sister Emeline Ann (Mrs. Stephen L. Holley) was loaned byEdward L. Holley, grandson. Mrs. John C. Clarke loaned a quilt made by her grandmother, Emeline Knapp, in 1831. 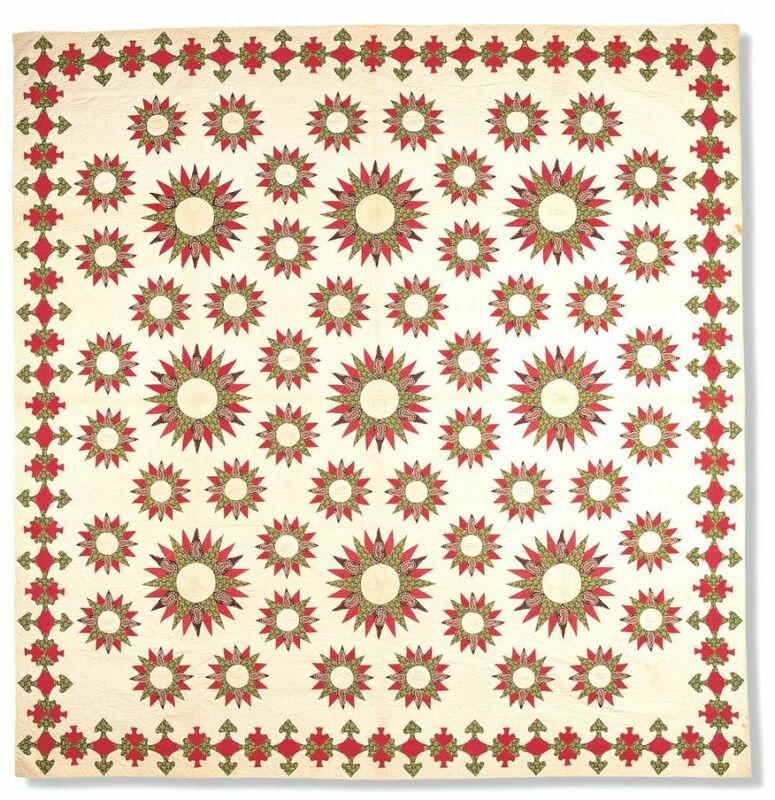 Sadie H. Mead loaned one that attracted unusual attention-a blue and white hand-woven spread with spread-eagle, Independence Hall and an all-over pattern of flowers. In each corner was woven "Agriculture and Manufacture are the Foundations of our Independence. July 4, 1834. M. J. Husted." Quilts made by the society in 1857 and 1860, loaned by Mrs. Isaac L. Mead and Mrs. George Marshall; Mrs. I. H. Chamberlain contributed a beauty, 95 years old containing 900 tiny pieces. Every article deserves mention, the entire display being marvelous, including a chair upon which Lafayette sat on at the old toll gate. At four o'clock the curtain of Time seemed to be drawn aside revealing a vision of the long ago. Mrs. Martha Street, in curls and dress of Colonial days, graciously enacted the part of Abigail, housekeeper for Parson Joel Mann, a hundred years ago. Dr. Huckel, completely transformed by wearing his grandfather's silk hat, cape and umbrella, the latter being his grandfather's wedding gift to his bride in 1819, and carrying his grandfather's large Bible under his arm, made an admirable Parson Mann, who had not yet been ordained. Miss Elizabeth Stillson, beautifully represented by Miss Lydia Ferris, in Colonial gown and bonnet, whose ancestors organized the Stillson Society, so beautifully represented Elizabeth Stillson it was not difficult to fancy Miss Stillson had stepped out of the past. Unburdening her heart in desire to aid the Indians and others who needed _____ stone of service in the onward march of missionary effort. Miss Harriet Reynolds as auctioneer, sold cake and the attractive posters. Halsey Kent paid $25 for the top mount of the cake made by Clarisse, with the inscription, to be presented to Miss Julia Bell, whose faithfulness all recognize but who was unable to be present. A remarkable coincidence was when Miss ferris, who portrayed Miss Stillson, found the Stillson engraved thimble in her piece of cake-and this was sheer accident, or was it fate? The officers of the Society are, Mrs. Frederick W. Bray, president; Mrs. Herbert S. Lounsbury and Mrs. Robert W. Wilcox, vice-presidents; Miss Susan H. Mead, secretary and Mrs. Amos H. Mead, treasurer. They were assisted by the following chairmen of departments, Mrs. John Clarke, Mrs. Adeline Husted Rungee, Mrs. Herbert Lounsbury, Mrs. Winfield Mills, Mrs. Andrew Bridge, Mrs. Frank Reynolds, Mrs. Margaret Street, Mrs. Davey and Mrs. Boyle. A.V. Pillsbury photographed those in costume as hey were grouped before the parsonage, which is 90 years old. The picture is printed with this article.